The truth came crashing home last year—a perfect storm of faulty genetics, the unrelenting march of age, and every athletic mishap I've ever stumbled through. After watching two kinds of arthritis stiffen my mother's joints—leaving her with fingers pinched into what she called her "flippers" and staggering knee pain—I suppose it shouldn't have been a shock to hear Emory rheumatologist Raluca Cozmuta gaze thoughtfully at my own X-rays and say the word I never wanted to hear. The most common form of degenerative joint disease, affecting millions worldwide, osteoarthritis (OA) is both quite ordinary and, for many of us, somewhat inevitable. 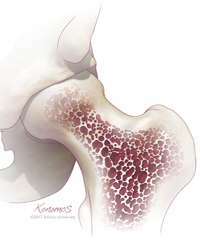 The cause is deceptively simple: Over the years, the slick rubbery cartilage that pads and protects the ends of our bones simply wears down, eventually leaving bone rubbing painfully against bone. Mautner's average patient is mid-50s, but he works with patients from their 20s into their 80s. Patients in good overall health with no underlying complicating conditions will see an improvement 75%-80% of the time, he says. While stem cell therapy may not be for everyone, "we're definitely seeing success with the right people under the right conditions," he says. "I'm seeing folks who were once candidates for knee replacement now five years out from stem cell treatment and doing very well." As physical conditions vary, so do outcomes. "I've treated folks who went from being very inactive to doing Ironman triathalons and those who are happy to just be able to take a walk again," he says. "The goal is less pain in their day-to-day lives, the ability to get up and moving." For John Bourke, a former college basketball player who punished his joints on the hardwoods well into his 50s, stem cell therapy has proven to be a game changer. The 62-year-old Suwanee businessman struggled with OA for years, a veteran of multiple courses of treatment. By the time he began meeting with Oluseun Olufade, a sports medicine physician at the Emory Orthopaedics, Sports & Spine at Johns Creek and assistant professor of orthopaedics, he had undergone two knee replacements and had severe hip pain. A cortisone shot had brought temporary relief, but the ever-present ache of OA—it felt like being stabbed with a hot knitting needle— returned with a vengeance. In fact, pain was a near-constant companion. "On my worst days, to drive to work, park my car, get out, and walk 30 steps into the building and 15 more to my desk was very, very painful," he says. Last year, Olufade raised the possibility of stem cell therapy. "He went to great pains to say that this is not a guaranteed fix—there was a possibility that it wouldn't help much at all," says Bourke, who would cover the $3,000 treatment himself. "But the more I heard about it, the more I liked the science of it," says Bourke, an electrical engineer by training. "It's not rebuilding cartilage, it's using your own cells to affect improvement in your joint, so there's not the rejection issue." Having twice before endured joint replacement, followed by long weeks of rehabilitation, he liked the idea of avoiding—or at least delaying—the intrusion of surgery. In his mind, stem cell therapy offered a welcome compromise. Compared with previous knee replacements, the procedure was simple and relatively painless. On January 11, Bourke reported to Emory Orthopaedics, Sports, and Spine at Johns Creek, where stem cells were removed from adipose tissue in his abdomen. With a local anesthetic, it was only mildly uncomfortable, he recalls. Once extracted, his stem cells were spun, isolated and reintroduced into his hip joint—probably the least comfortable part. He compares it to receiving a cortisone shot. After about 10 minutes, Bourke was allowed to leave, with orders to stay off his legs for a few days. Within several weeks, he began to feel improvement. Now more than two months out, having completed a dedicated course of physical therapy, he's thrilled with the results. "My hip has improved a ton. I'm doing the best I've done in a long time," he says. "I own a couple of acres, and I've been able to get out and walk on my property and return to the gym, working on getting my weight down again." If the treatment had to be repeated in a few years, he says, he would gladly do it again. It may sound like a modest victory, but in the lives of his patients, Olufade recognizes that conquering daily pain is a huge achievement. "The goal from my perspective is to keep people enjoying what they enjoy. High school student, professional athlete, middle-aged person—it's really just about helping them function the way they want," he says. Beyond OA, Olufade has also used stem cell therapy to help with tendon and rotator cuff injuries. "The goal is to help address pain," he says. His patients come to him with a myriad of conditions and hopes for relief. A 30-year-old man desperate to avoid a knee replacement. A middle-aged woman who yearns to ride horses again. An executive looking to recapture his golf game. An 85-year-old man who simply isn't a strong candidate for hip replacement surgery. "Stem cell therapy is an option for athletes," says Olufade, "but also for the guy who just wants to live a normal life and play soccer with his grandkids."